NEW: What Is Reformed Theology? (Paperback) is now available in the Ligonier store. You’ve heard of Reformed theology, but you’re not certain what it is. Some references to it have been positive, some negative. It appears to be important, and you’d like to know more about it. And you want a full explanation, not a simplistic one. Few evangelical Christians today understand Reformed theology. They know it has something to do with predestination, and they may have heard of “the five points.” But they can’t name these points, and they think no one believes most of them anymore. Dr. R.C. 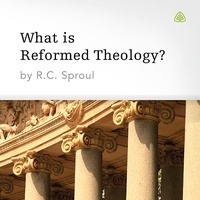 Sproul says there’s more to Reformed theology than these five points. Reformed theology reveals just how awesome the grace of God is. The roots of evangelical Christianity are found in the soil of the sixteenth century Protestant Reformation, which brought a return of true biblical theology to the world. In this series, Dr. Sproul offers an introduction to Reformed theology, the heart of historical evangelicalism. C.H. Spurgeon once said that Reformed theology is nothing other than biblical Christianity. For years I had this doubt of how God "know" that some people would be saved but people have "free" will to choose too. This series has helped me to understand clearly how free will is limited within God's will. It was a relief when I heard this explanation. Everything made complete sense then. :) Thank you so much. Grateful to God and my dad for introducing me to R.C. Thank you R.C and team for your contribution to preaching God's Word so systematically. Although I had used Charles Haddon Spurgeon's Morning and Evening previously, What is Reformed Theology? under the original title Grace Unknown, was the first book I ever read by a Reformed scholar to get an overview of Calvinism. This book cleared up many misconceptions for me. Right after finishing that book, I read Faith Alone, and some years later, Getting the Gospel Right, which form a trilogy of books on the basic teachings of the Reformed Faith. I recommend all three books! This series is an outstanding overview of the shape and contours of Reformed Theology. Dr. Sproul provides much clarity and insight as he shows how Reformed doctrine embraces all the major components of orthodox Christian teaching throughout Church history, while revealing the biblical distinctives. As a pastor, when people ask me what reformed theology is, its this series I point people to as a very helpful starting point.